With weather yesterday in the 70s and sunny I was dreaming of the beach! I was hoping to go to Olympic Sculpture Park and was able to rope in a friend to join! Except that the baby didn’t want to go for a bike ride. He started out grumpy and his mood didn’t improve. I think it was a combination of sun, an overly floppy hastily attached sunshade, wind from not having the cover on, and DST waking us up later so we had less morning play to get our wiggles out. Even though it was only in the 50s when we left home I didn’t want to bake the baby as the day heated up so we took off the cover for the bakfiets. I’d never ridden without the cover and it was so nice! It somehow felt easier to get places, although maybe it was just the nice weather. A few months ago I ripped the sun shade from our stroller and it was under warranty so they sent us a new one. It has Velcro on the sides where it wraps around the stroller frame so we stuck the Velcro to the car seat. Then we tucked the back part of the sun shade down against the box to keep it from blowing away. I added a thin muslin blanket to provide additional coverage. But it was too loose! The shade ended up being too floppy and baby H was not a fan. But also he didn’t like the sun in his face. No winning kiddo. So after many silly songs and no signs of cheering up we stopped for a quick on board nursing session. So much easier without the cover attached! While he nursed I watched some sparrows flit around in the trees and practiced my squats. I’m 100% people thought I was doing some sort of crazy dance but the baby was happy. After about 10 minutes we were off again! But still unhappy. We made it about 5 more minutes of riding before a total meltdown. So out of the bike and onto the grass! At a very non scenic spot. But H was happy to throw his ball and wave his arms. Plus he discovered a new sound of the day: BEEP BEEP! Everyday he likes one new weird sound. But the next day that same sound is boring to him. Babies. At this point I didn’t think we could make it to the park so texted my friend to see if they were down to meet up at the locks. They were! We hung out for about 20 minutes before starting out again. This time we were relatively happy (with a few roadside dandelion stops of course). And I made it up Emerson! 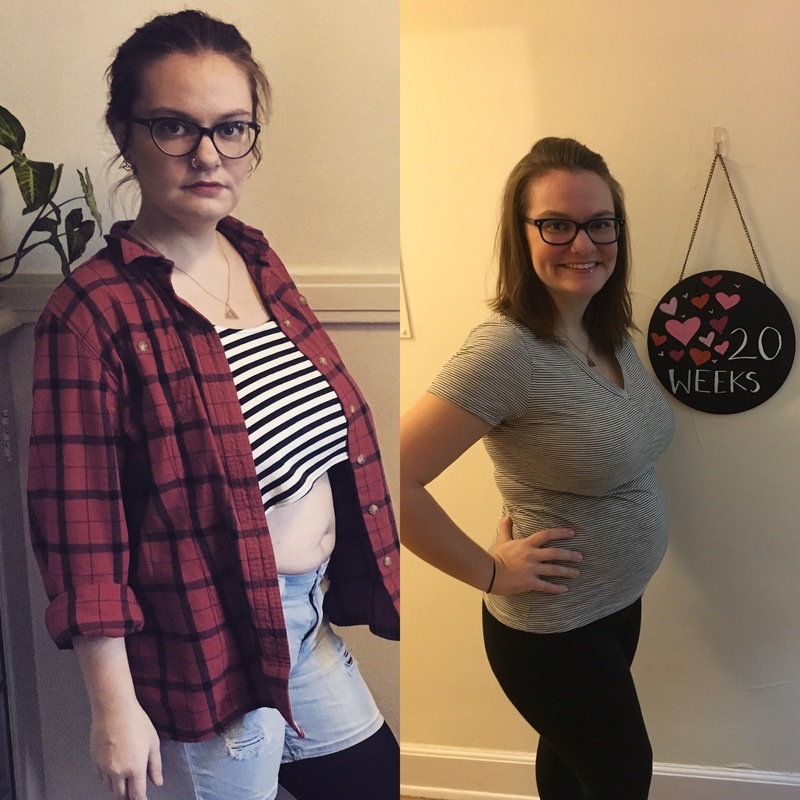 I had to walk up in the pouring rain 6 weeks ago so I was extremely proud! Go me! I decided to try out a new route to the locks. I rode up Gilman in the new protected lanes until the end then followed the signs for the locks. It took us down a relatively steep trail, across a narrow wooden bridge, and then down another steep but short street. And boom! Arrived! It was much nicer than riding on Market or even on 21st. At the locks we picnicked for a bit and then Jen tested out my bakfiets with her nanny baby! He loved it! Or maybe just the new toys in the car seat. But then I remembered it’s a crazy expensive fine for riding in the locks so we put an end to that. I’ve been biking around with a folding chair for 3 months and finally got to test it out while nursing! It worked great! Totally worth the extra 3 pounds or so. I reversed our route for the way home, walking up the steep street. Of course as soon as we got to the bridge we had a massive diaper blow out! So out of the bike, onto the ground, changed him in a pile of pine needles. And then back on, and up the hill to Gilman. He ended up sleeping the whole way home! It was fabulous! I stopped a few times to adjust the little blanket but he stayed asleep until I unlocked the door. Oh! Join me for full moon rides! Next one is 3/31. Ride from the Wall of Death at 9! Not too long ago I didn’t think it was possible to ride to Discovery Park. 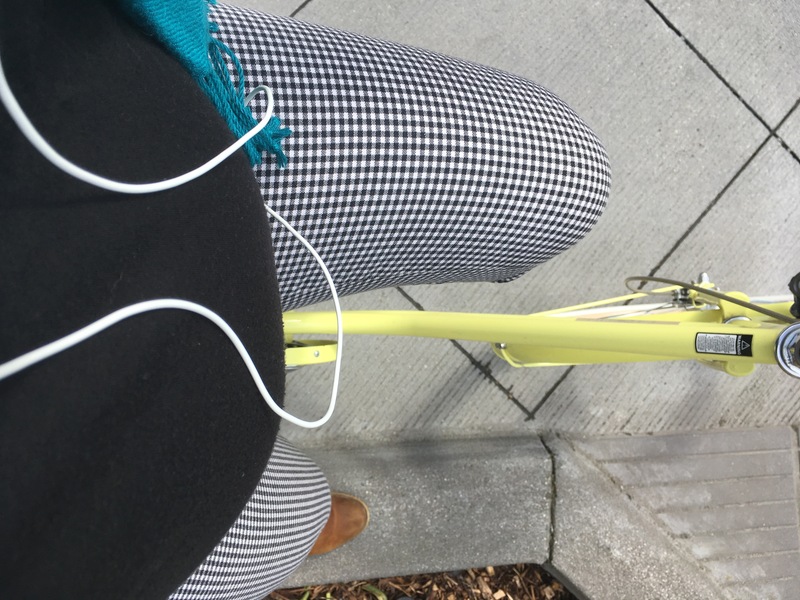 When I was 37 weeks pregnant I accepted the (self-imposed) challenge & rode over. And then down to the beach. And on the way back up (mostly walking) I thought to myself: if I can make it up this hill, I can totally give birth. I was pretty sure I’d give birth on that hill, I was having so many contractions! On the way home I noticed new markings indicating a change in the bike lane. And while recovering from birthing H they did it! They made a protected bike lane from the end of the Ship Canal Trail to Magnolia Town Center (about 4 blocks away). 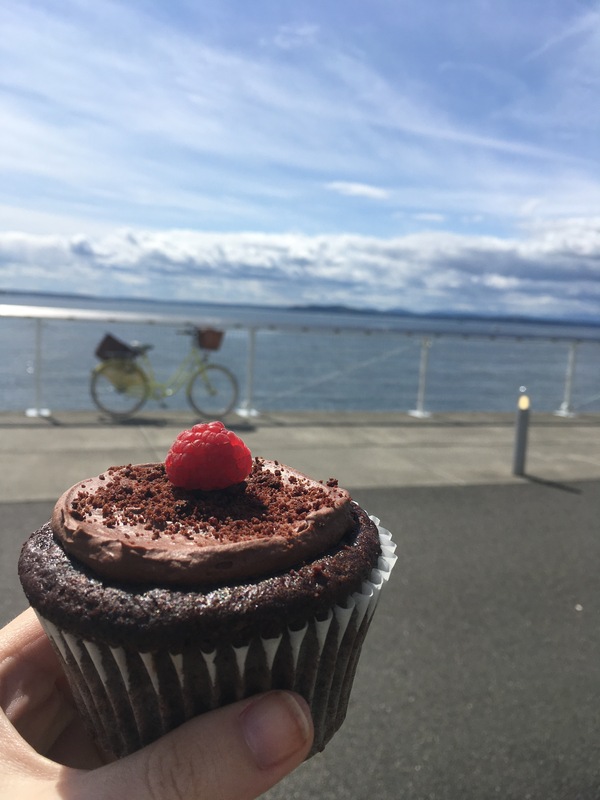 We had ridden over last month for a family picnic and hike and it was glorious (minus those last 4 blocks – WHY YOU DO THIS TO ME SEATTLE?!)! So we were back! And I was determined to find a way up to the bluffs where there’s a big sandy patch perfect for exploring. We made it with only minimal breaking of the no riding on trails rules and I think I figured out how to go next time to avoid that issue. I’ll post the route once I confirm. The day was clear and the Olympics were out! We spent about 40 minutes shoveling sand into our mouth before I packed us up and headed for the playground. The playground squirrels are bold! One climbed into the bike trailer while we were on the swings. The protected lanes worked well except when we had to turn from Gilman onto Emerson. I signaled our turn too adamantly & ended up biking into the soft bollard in the middle of the lane, where my toe got caught underneath it! I thought I was going to have to take off my shoe! After several awkward minutes of jiggling my foot I was free! And we made our way home without further incident. 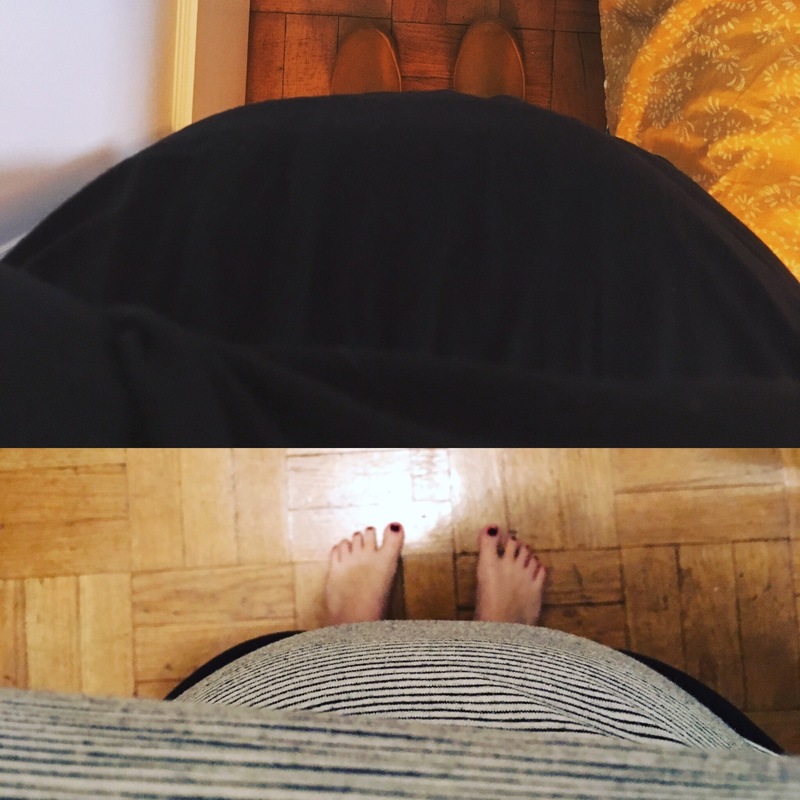 Real talk: pregnancy is weird. I can’t bend over to tie my shoes but I managed to bike 15 miles today. I had a meeting over coffee in Belltown this afternoon & the weather was beautiful so I decided to bike & I definitely do not regret my decision! I opted for the Westlake option to getting around Lake Union, although GoogleMaps tells me that Eastlake is shorter. I didn’t actually stop off at Gasworks on the way there, but it was the only way to capture my whole route. It took me the predicted 40 minutes, which was surprising since I tend to be a slow rider. Much of the way was ever so slightly downhill though, so I think that tipped the scales in my favor. I was nervous about getting tacked on Westlake because I keep reading about it happening to other people, but so far so good on that front. I’ll often take the long way around to get from the Burke Gilman to the Fremont Bridge, but today I wasn’t feeling the bumpiness by Google & didn’t want to be late so I opted for the road. The bike lane is closed there due to construction but it was mid-morning with virtually no car traffic. After Westlake I headed up a block to turn onto 9th (using the pedestrian signals) & rode along 9th to get to Bell St. It was a pretty quiet, although I did have to go around 1 FedEx driver who had parked in the bike lane. I walked the first 2 blocks of Bell because they’re pretty steep uphills & I didn’t want to tire myself out too much. Plenty of drivers disregarded the bike/bus only signs but short of in-person enforcement I don’t see how to fix that problem. Bell is really nice to ride on: vibrant, narrow, well landscaped, and human-sized! At the end of the hill I turned onto 1st where I rode on the sidewalk for 1.5 blocks to the coffee shop. 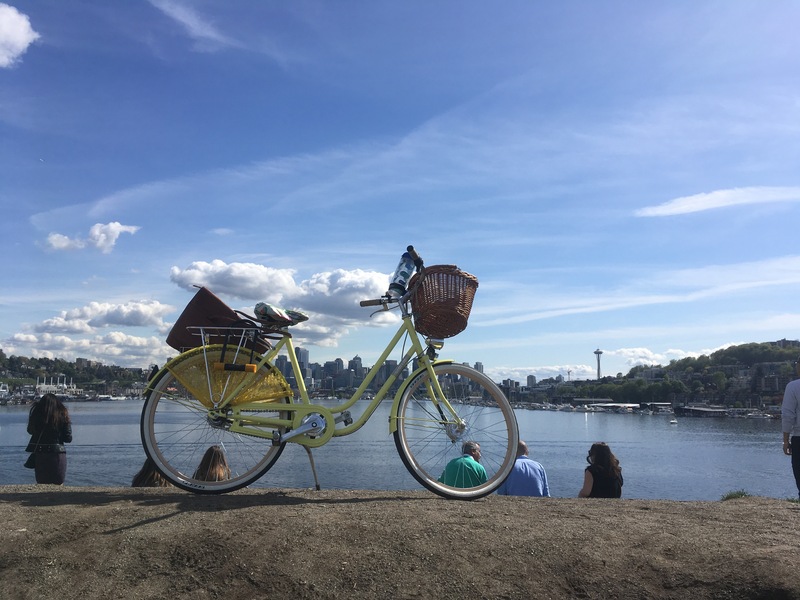 After our meeting I wanted to take my time riding back (because who really wants to spend a sunny afternoon writing a paper on the Alaskan Way Viaduct?!) so I opted for the long way home. With a cupcake to go, of course. It’s a steep downhill from Wall St to Elliot Ave but the combo coaster/hand brakes made it safely. I stopped for my cupcake after passing the face & would highly recommend the splurge purchase. $5.25 is a lot for a small pastry but DAMN! This had actual whole raspberries inside! There were a ton of people out & about on such a beautiful day so the trail was pretty crowded. Luckily there’s a bathroom by the pier because baby has been enjoying sitting on my bladder! It was a nice slow ride from here to Balmer Yard in Interbay. From here I hoped on the bike lanes on 20th Ave W. Where it switches over to Gilman Ave W the bike lanes drop out but there was space to ride in the parking lane with relative comfort. 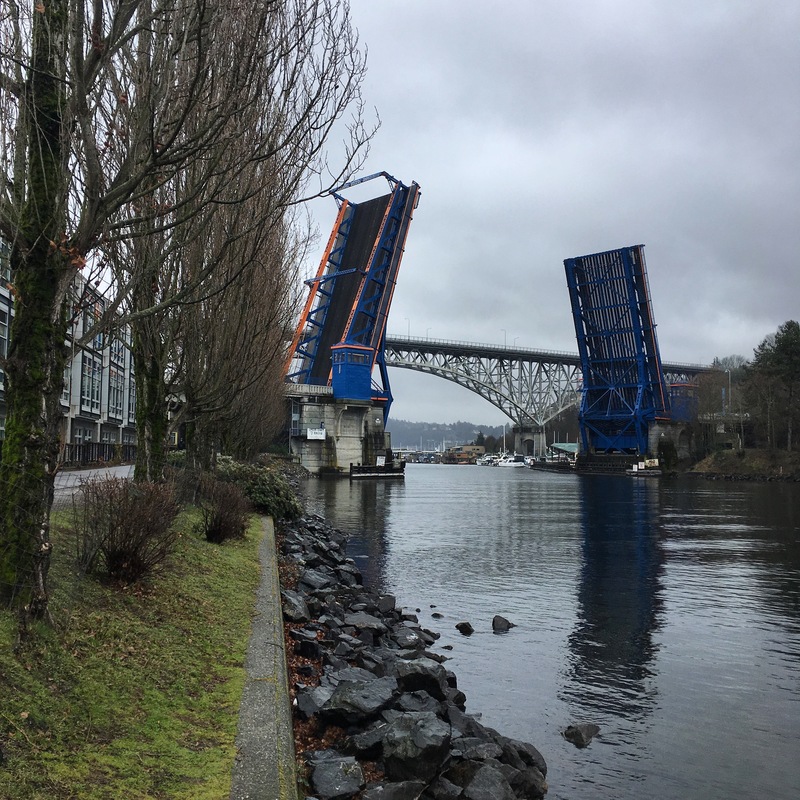 I’d love to see this transformed into a protected lane here to allow for a better connection to the Ship Canal Trail. After turning onto W Emerson Pl & heading downhill I hoped onto the trail to head back to the Fremont Bridge. I made a pit stop for snacks at West Ewing Park, across from Wallace Field before heading up & over the bridge. I rode along 34th to get back to the Burke Gilman & then made a quick stop over at Gas Works. I rode almost to the top of Kite Hill, but ultimately decided it was best to walk up. It wasn’t too crowded but there were plenty of people out enjoying the sunshine! Then I stopped off by the water before making my final turn towards home. Overall a great day out in the sun & I’m glad I postponed paper writing (jk – ask me about that tomorrow)! My body is quite pregnant. But my brain is quite determined to forget that. Like yesterday when I convinced myself that I could bike 4 miles in 25 minutes & would be FINE. This would be my non-pregnant biking speed. But my brain had committed my body & so here we were. Lost. Angry. In the pouring, windy rain, riding in circles around & around & around. Five minutes late became 35 minutes late & I devolved into a hopeless mess as I failed to find my location. I thought I was losing my mind. In the end I found my destination (no thanks to googlemaps) by cutting through a hole in a fence. I was only 500 feet away from it the whole time, a classic can’t get there from here scenario. 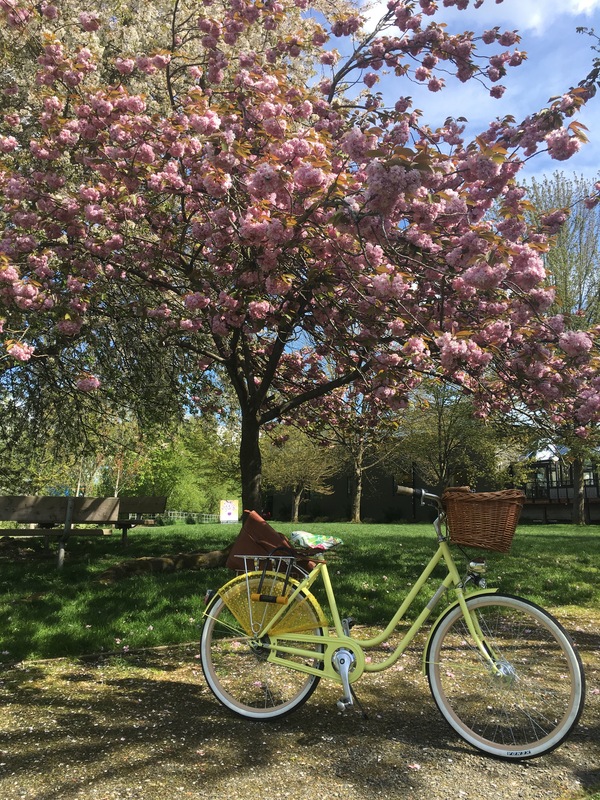 I biked through a panic attack, during which I beat myself up for being utterly lost & helpless, unable to complete the simple task of navigation. I resisted the urge to puke while choking back my tears. My pregnant body decided hemorrhoids would be a nice gift to my un-listening brain. My round ligament protested my frantic pedaling & repeated carrying of my very heavy bike over very tall curbs. Today my whole body hurts. Maybe my brain will start listening. But this is doubtful. My brain just reserved a camp site for bike camping over Memorial Day weekend. My body doesn’t know yet. I wonder what fun punishment she’ll spring upon me after that trip. Monday was a good day. I woke up craving black coffee, which is a BIG DEAL. I haven’t wanted black coffee in MONTHS. It started giving me such bad heartburn around 8 weeks & I’ve been avoiding it ever since. It was cold and sleeting out but I had a sudden urge to sew curtains for the nursery. So obviously I had to follow it! I had a few hours in between meetings so I decided to ride over to the Jo-Ann’s Fabric in Ballard to scope out my options. Does anyone else ever have an overwhelming urge to tackle projects that are way outside your scope & then get in way over your head? I was totally underdressed in the leg region. 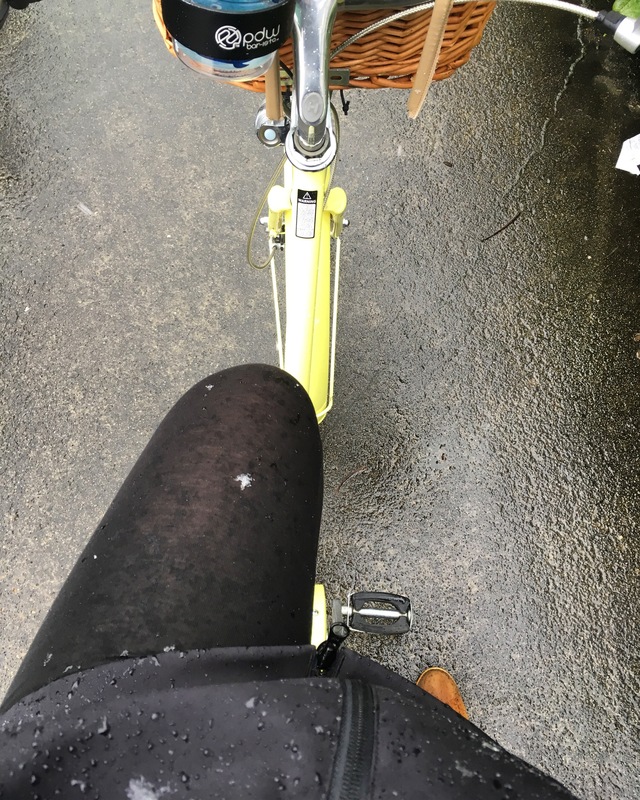 My maternity leggings are relatively thin & opaque. With the misty sleet I was worried about getting too cold by the time I reached Ballard. I tried tying an ikea bag around my waist but it kept moving around so I ditched that idea after only a few minutes. Shortly after consigning myself to getting wet it stopped raining. Yay! I rode by a bunch of kids playing along the trail & resolved to research if there is a daycare nearby. There is! And they take infants! And they have spots in September! Granted, they are the most expensive option on our radar, but I’m going to take a tour & we’ll see how it goes. Riding slowly along in the cool air while sipping my coffee was amazing. 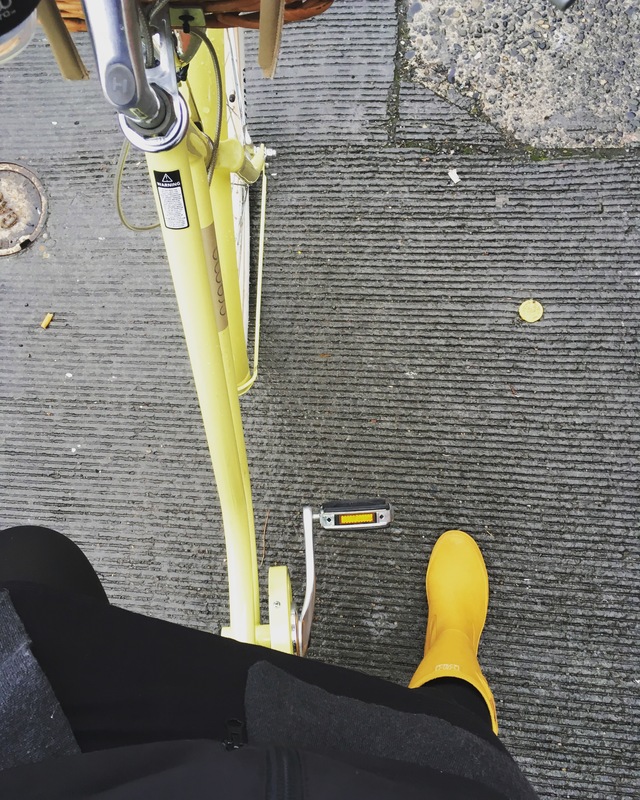 It used to be my favorite part of the day – my commute to work – but now my ride is so short and coffee free. I’m pretty sure my smile was contagious – if only there were people outside to see it. I realized that there’s a 1/2 block of sidewalk along Shilshole where the trail extension ends that runs you to 17th. This worked quite well, but I would be very careful here when you make the turn since people drive so fast and often don’t check that crossing before they turn. My ride up Market was slow but pleasant as there was no traffic to speak of. I had to lock up to some railings but at least it was covered! It seems strange that there’s no bike parking here when there’s so much around the corner & across the street. I found fabric I liked for the curtains and more cute fabric for burp cloths & bibs for lil nug so it was a success! My ride home was a bit colder, despite no rain. My mittens were damp and my fingers froze for the first 3 miles or so. By the last mile they had warmed up, but it was definitely cold there for a while. I also accidentally splashed in a puddle and had one wet and muddy shin which was kind of a bummer. Oh well. Here’s to hoping it warms up soon. You know that feeling you get after Thanksgiving when you’ve eaten everything in sight & the beer in your tummy is fizzy? When you’re so full that you feel it in your stomach and your back? This is how I feel all the time now. Today I took Creme to campus. I haven’t been doing much riding recently because I’ve been spending so much time in studio & the GIS lab. When I do ride it’s usually Boda since I often want the carrying capacity of the giant basket. It was sprinkling so I opted for my coat instead of my cape since I wasn’t going far. The pockets of my winter coat are front hip pockets & even just having my keys in there makes me feel too full! Hopefully it warms up enough to switch back to my other jacket with a back hip pocket. The ride home was slow. Like turtle slow. Like my bike may have defied gravity slow. I took the Ave until the end of the bike lane & then took Brooklyn the last 2 blocks since there’s less traffic & I can go as slowly as I want without anyone revving their engines at me. But I made it up! I had my doubts. I was feeling so stuffed. Like all my organs were pushing against my skin & I was going to burst through! But I made it up. So here’s to making it up & growing tiny humans & being awesome. 2016 was a big year for us. We traveled quite a bit & then we sold everything we owned & moved across the country! Puerto Rico! We took a delayed honeymoon to Puerto Rico & spent our days lounging by the pool & hiking in the rain forest! We hiked up a closed highway for an amazing view & then swam in a crowded and cold waterfall in the only tropical rain forest in the US. I brought back a mild case of Zika but the fried plantains were totally worth it. Amsterdam! We took a whirlwind trip to Amsterdam after finding an amazing deal on flights. Mike forfeited his license at a bike rental shop so we could make our flight on time. We loved riding around & exploring the city & dreaming about raising our future babies in such a family friendly city. I sold my first painting! Paperwork! After returning from Europe we finally worked on our name change documents. It’s complicated to change your name & it’s even more complicated when it’s a full name change (not a maiden name). I had been suffering in pain for a long time & finally found a diagnosis. I received my acceptance to the University of Washington. I was accepted into my first juried show! I started treatment for my pain & was finally able to see some minimal relief. I was anxiously awaiting word on my application to Portland State University. Eventually I heard that I was not accepted to the program & was reconsidering our move to the West Coast. I sold a number of paintings in a prominent local show. I spent some time in New Hampshire for my sister’s graduation. I accepted my position at UW. A quick turnaround lead me to Seattle for a few days in search of an apartment for us. I met some amazing & friendly humans who helped me get a better sense of the city & which neighborhood to live in. I sold 8 paintings & had my first solo show! June was a blur! My doctor recommended surgery to cure my pain & we were able to schedule it for just 2 weeks later. I spent 2 weeks on bedrest post-op & the rest of my time was packing, packing, packing. I left my job on a Friday & we left for Seattle the very next morning! We spent 2 weeks driving across the country, camping in national forests & failing to shower or brush my hair for many days on end. There were a lot of pit toilets. We cooked our meals over open fires & enjoyed a lot of canned beans. We arrived in Seattle with the dogs (still married) & picked up our few possessions from the train station. Our bikes arrived in the mail & we furnished our apartment with a combination of Goodwill & IKEA furniture. We sold the Prius & became a car-free family! I did a lot of healing in August. My body was still exhausted from the surgery & our trip so I spent a lot of time reading on the couch. I also started learning to play the ukulele. I got back on my bike! It was slow at first but I was able to ride comfortably quite quickly after hopping back on. My program was in full swing! Lots of new people to meet & remembering how to be a student again. I went on my first Critical Lass with some amazing ladies & a ton of positive feminine energy. I thought about adding another 2 years & an extra degree onto my program. 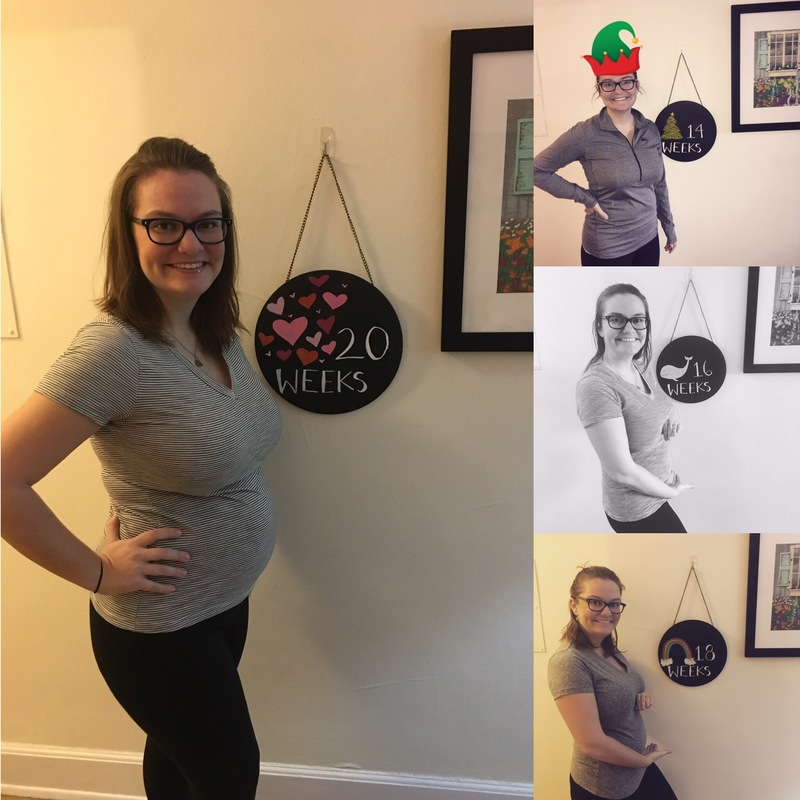 I found out I was pregnant! And we didn’t really know what to think because we were so sure it wouldn’t happen after years of me being told it would be difficult & I would need fertility treatment. Turns out doctors are wrong & it can happen the first time! Being pregnant got more real & I felt nauseous tired much of the time. By the time Thanksgiving rolled around I was over this quarter & just wanted to be done with classes! I decided to switch my focus to Transportation Planning & take electives in Urban Design. I won’t be staying on for the additional degree. 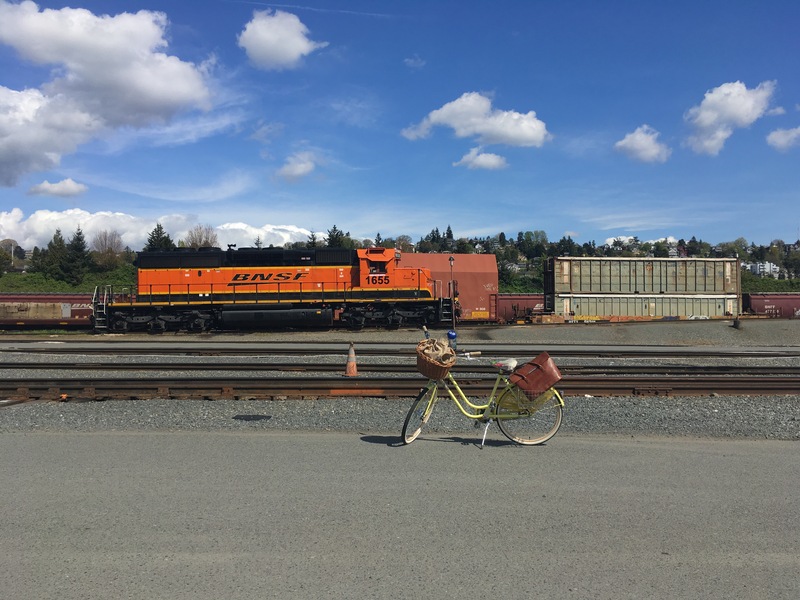 We took our bikes on the train to Portland for the weekend & enjoyed exploring a new city. Finals seemed to stretch on forever & I think I spent 2 weeks not sleeping at all. I slept for 18 hours straight after submitting my last paper & then all of the pregnancy sickness caught up with me. Much of the last 2 weeks has been spent in bed eating saltines & drinking gatorade which has been less than ideal. I’m hoping to finish out the year on a positive note & eat a real meal (& keep it down) for dinner! Here’s to finding out what 2017 has to offer! More #errandonnee with trips to Second Ascent, Quality Sewing Supply, Lucca, Clover, Top Pot, Gas Works, Recycled, and finally the doctor. Now I need a nap! Hung out at Gas Works with @hey_nicebike then had to hit goodwill for emergency pants before heading to another park because the sun came out. Happy #errandonnee !